Things To Do In Vancouver During March - For Cheap! 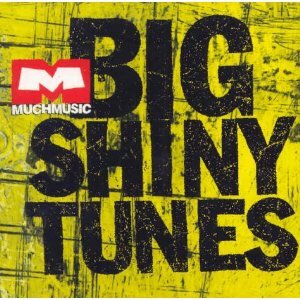 March 1- Big Shiny 90's Bingo at The Media Club! A monthly event for all those that grew up in the 90's or just love nostalgia. All you can play bingo complete with 90's music (requests taken! ), 90's trivia, and awesome 90's prizes. If you miss your childhood Teenage Mutant Ninja Turtle or are just a huge fan of Trolls, this is your chance to win one. Doors open at 8pm, first round of bingo starts at 8:30. $5 at the door. Hosted by Like Found Like. Awesome Deal Just For YOU!! - VANCOUVER, WE LOVE YOU SUPPORTERS WHO SHOW THEY FOLLOW US ON TWITTER OR MENTION "VANweloveyou" AT THE DOOR GET IN FOR $3.00!! March 2- Paul Anthony's Talent Time at The Biltmore! Paul Anthony hosts this live monthly comedy/variety/chat show that guarantees a good time. Past guests have included Miniature Mariachis, Comic Hypnotists, Celebrity Impersonators, Extreme Wrestlers, Airbands, Drag Queens, Magicians, Laughing Meditation Demonstrations and Tribute Bands. If that's not enough of a reason to check it out (which really... it should be), the event also includes a Cover Charge Pinata. Lucky audience members are given a chance to whack it and hope they get their money back! Show begins at 9pm. $8 at the door. 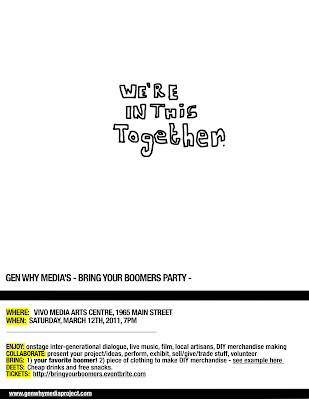 March 12- Gen Why's Bring Your Boomers Party at Vivo Media Arts Centre! If you're part of "Generation Y" you need to know about the Gen Why Media Project. A collaborative group of smart and engaged young people doing great things in media, culture, and communities. 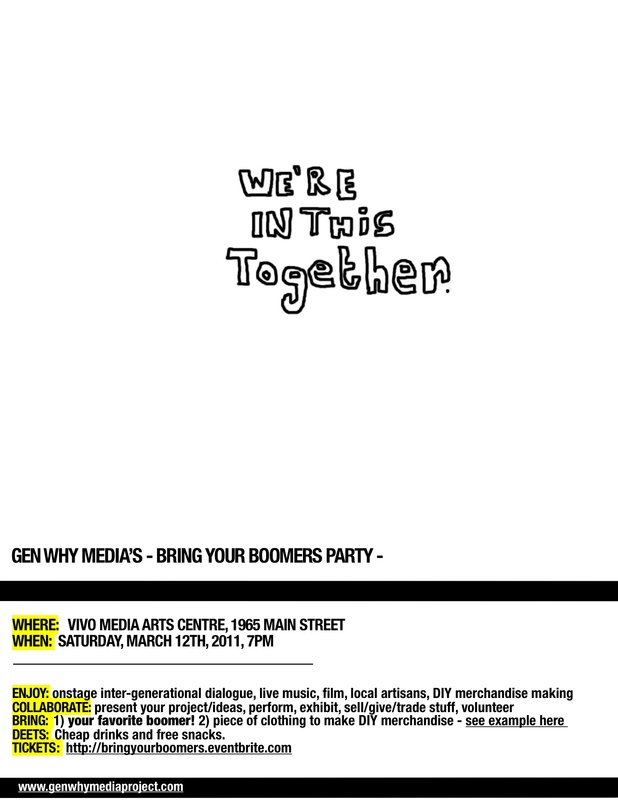 Bring Your Boomers Party is their second engagement event and will feature speakers such as multidisciplinary artist Ken Lum (creator of the East Van cross), 65_RedRoses director Nimisha Mukerji, and human rights lawyer and law professor Kathleen Mahoney. The evening also includes live music, drinks/snacks, local artisans, and a DIY Gen Why t-shirt making station (BYOShirt). Event starts at 7pm. Tickets are $10. March 13- Kid's Stuff Only Market at Coal Harbor Community Centre! Looking to buy or sell children's items? Need the missing Dr. Seuss book for your collection? Have too many Dora The Explorer dolls and want to sell a few? Look no further, just attend this event! If you have children's books, clothes, toys, or other items to sell you can reserve a table for $19. Tables available on a first come, first serve basis. To book a table, go here or call (604) 718-8222. No merchants or businesses. Event is free to attend. March 17 - World's Greatest St. Patrick's Day Ceilidh at The Yale! Any time someone boasts a "World's Greatest" anything it's worth checking out, even just to judge if it is in fact the world's greatest. The Celticfest's World's Greatest St. Patrick's Day Ceilidh is no exception. The event boasts "a dozen of Canada's hottest Celtic musicians come together to cook a sizzling feast of music, dance, and jamming." Sounds delicious. Tickets are $20 in advance or $25 at the door. If, however, you're not into ceilidh's or are looking for a family event to celebrate St. Patrick's Day, not to worry! The Celticfest is hosting a generous listing of free and family events over St. Patty's weekend, including a parade, dance work shops, sword play demonstrations, face painting, and gaelic football and hurling skills demonstrations. With so many options to choose from, you don't even need the luck of the Irish to find something fun to do. March 26 & 27- Thing to Thing: The Makeshift Project at The Vancouver Art Gallery! This is not a magic show, but it sounds just as exciting. Artist and designer Natalie Purschwitz will turn personal objects into functional bags. Bring any sort of object and watch her transform it. Abracadabra! Part of the WE: Vancouver exhibit and free to attend with gallery admission. March 30 - Rain City Chronicles at The Waldorf! Interested in the stories of random strangers you might meet in every day life? Rain City Chronicles believes everyone has a great story to share, and provides a space for people to tell theirs. Check out their latest night of storytelling. Featuring a diverse grouping of speakers and delicious eats and drinks, this is a fantastic event to check out. Tickets are $10. Starts at 7pm. Are you hosting an event you think we should know about? Send us a note at info@vancouverweloveyou.com and we'll try to include it in an upcoming post! And as always, we love hearing from supporters and seeing pictures of our shirts around town so if you attend any of these events (or any we haven't included) wear our Vancouver shirt and send us a picture!